ArcCatalog users organize, work with, and manage geographic information in workspaces and geodatabases. Workspaces are simply file folders on disk that are used to organize your GIS work—map documents, imagery and other data files, geoprocessing models, layers, geodatabases, and so on. Workspaces provide a simple way for you to organize and share logical collections of GIS information. ArcCatalog helps you by providing an integrated and unified "catalog tree view" of these various sources of information. This view works much like Windows Explorer, enabling you to find, organize, and manage your various ArcGIS documents and datasets. This topic provides a tour of how ArcCatalog is used and also introduces tasks that can be performed with ArcCatalog. ArcCatalog provides an integrated and unified view of all the data files, databases, and ArcGIS documents available to you. ArcCatalog uses two primary panels to navigate and work with your geographic information items. 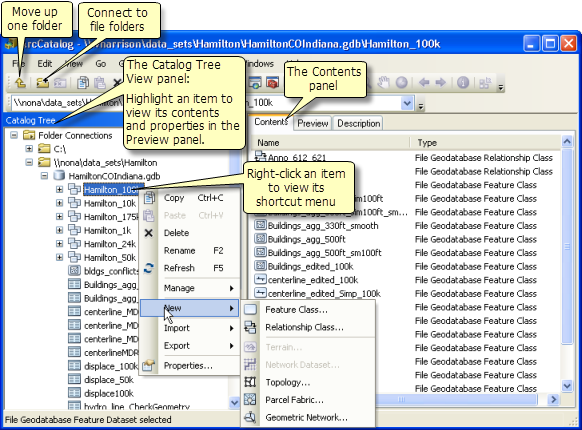 Use the tree view on the left to navigate to the content folder or geodatabase that you want to work with. Highlight an item in the tree view to view its properties in the right panel. To work with any item, right-click the item to open its shortcut menu, which provides access to a range of tools and operations. For example, you can click New on the shortcut menu for the dataset above to add a new feature class. You can work with the Catalog tree to make new connections, add new items (such as datasets), remove items, copy items, rename them, and so on. When working in many applications, the information items in the Catalog tree may not display the latest state of all ArcGIS information. In these cases, it is useful to refresh your GIS content. Right-click the item you want to refresh in the Catalog tree to view its shortcut menu and click Refresh. You can drag data from ArcCatalog into other ArcGIS applications. For example, you can drag a dataset onto the ArcMap data frame to add the dataset as a new layer. ArcCatalog includes the ArcGIS Search window, which you can open by clicking the Search button on the Standard toolbar. This displays the Search window. Pausing on a search result displays its item description. 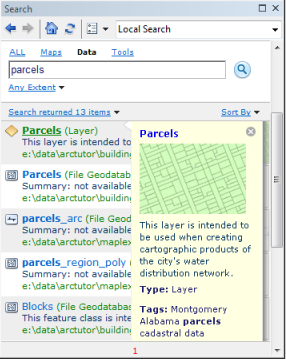 See Using Search in ArcGIS for more information. You can document datasets, maps, models, globes, and other items in ArcCatalog. This includes the ability to work with standards-based metadata, which can be created, edited, viewed, and exported. ArcCatalog contains a number of toolbars that are used to view datasets and perform a number of workspace and information management tasks in ArcGIS. For example, when using the Preview tab to view your data in a map view, you can use the Geography toolbar to zoom and pan across your dataset. To open a toolbar, expand Toolbars on the main Customize menu and click the desired toolbar. Here is a quick review of some of the commonly used toolbars in ArcCatalog. This contains a set of commonly used tools for managing items in your catalog and options for viewing their contents and opening ArcMap, ModelBuilder, and other ArcGIS application windows. The Standard toolbar typically appears at the top of the ArcCatalog application. When you use the Preview tab and set the view type to Geography, you can pan and zoom your display using the Geography toolbar. You can also identify features and use the Create Thumbnail button to generate a thumbnail snapshot that can be inserted into the item description. You can use the Location toolbar as an alternative way to add folder connections to the Catalog tree. You can manage the metadata for all of the GIS items within a folder using this toolbar. Validate the metadata for all of the items in the selected folder. Export the metadata to a standard schema. Set and view metadata properties for the highlighted GIS information items. You can use the ArcGIS Server toolbar to start, stop, and administer ArcGIS services from ArcCatalog. Make connections to geodatabases, GIS servers, and other information. See Making connections in ArcCatalog. View information items, properties, and their contents on the Contents and Preview tabs. See Working with the Contents and Preview windows. Use ArcCatalog to manage contents in folders and geodatabases. See Working with folders and geodatabases. Work with maps in ArcCatalog. See Working with map documents. Document your information items and working with metadata. See Creating item descriptions. 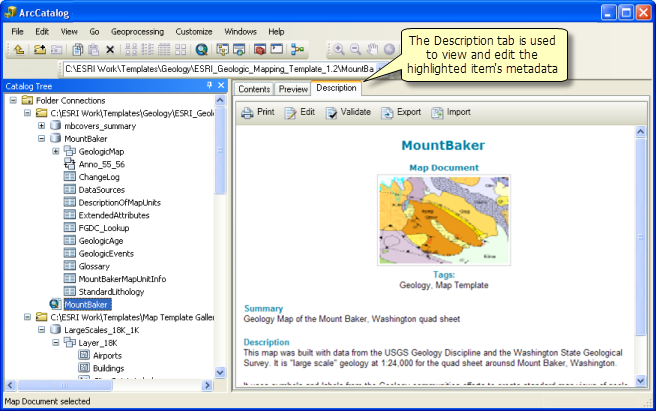 Use geoprocessing in ArcCatalog. See Working with ArcToolbox in ArcCatalog. Manage GIS services. See Connecting to GIS servers.